On Friday, April 11th, we held our first ever “Spring Fashion and Art Show” to celebrate beauty, community, and raise awareness for our ministries at Oldenburg Franciscan Center and Michaela Farm. Thanks to the collaborative support of Goody’s, Guys and Gals Quarters, Margaret Mary Health Weight Management Services, Oldenburg Academy, DJ Mark Volz, Artists S. Sandra Schweitzer and S. Michelle Corliss, and several generous individual partners, it was fabulous event! We love these pictures, courtesy of our photographer, Yenny Ho! I have been coming to Oldenburg Franciscan Center for about 5 years now. The first time I came, it was at the invitation of S. Olga to attend a workshop on “spiritual tasks” for our journey with God. I learned so much that weekend, and the experience was powerful enough that it broke loose something inside of me that wanted to be freed. So I came back, again and again, seeking that wholeness, that liberty. So much happens in five years, as any of us might know. After several months of absence here, I returned last night to make a ‘silent retreat’ of my own. It was a brief visit – just a moment I stole for myself to repeat a journey I’ve taken many times here at Oldenburg – an evening walk through the Sisters’ cemetery under a starlit sky. I love the dark, peaceful expanse of the cemetery, so far from city lights, so warm with prayer, and so populous with stars at night. It was pretty cold outside, so I didn’t stay out as long as I might have liked. But it was a nice night for a stroll in the cemetery, and for all the walks I have taken there, I found myself pausing to do something I had never done before. 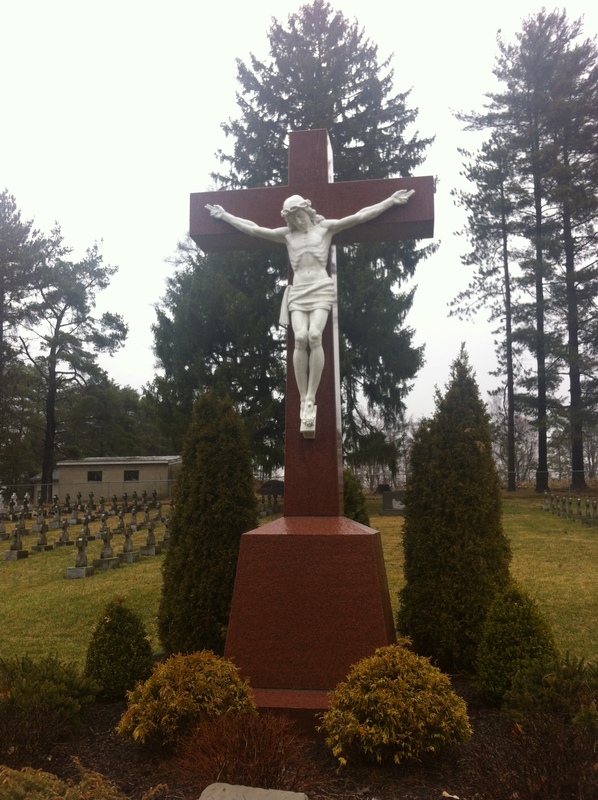 I sat in front of the large crucifix in the middle of the cemetery and quietly pondered the image. It struck me that I’ve carried many a prayer through this cemetery, whispering prayers under the stars. So much of my life has changed since the first time I did that… and yet, I have new doubts. So, sitting under the crucifix, I placed my lenten confession: I don’t know whether I’m finding my faith or losing it. Where am I with God? I recognized all the life-giving graces that have come into my life since the first time I walked this cemetery under the night sky… it’s been an amazing journey, full of God’s presence. So I just prayed for the grace to know what I need now to calm and direct my uncertainties. What’s next? And, oh, for a moment my blurry eyes worked a spiritual blessing – as it seemed Jesus leaned forward and his arms came down from where they were pinned to the cross. What a true and beautiful prayer – to feel like I could be there to help Jesus down from the cross – to imagine how exhausting and deathly it is to remain there. Suddenly, I imagined myself walking up, letting his arms fall around me to finally come down off that cross. What it really said to me is that it’s time to come down from the cross. Jesus, and me. And I relaxed into a dream of comforting rest, with that role reversed. The crucifixion has passed. I’m coming off my self-imposed cross into the arms of a comforting Jesus. It is time for life after death. As for the question of finding or losing my faith, that seemed so simply answered with a thought of John 12:24. “Unless a grain of wheat falls upon the ground and dies, it remains a single grain with no life.” Belief as I have known it may have died. But my faith hasn’t departed. It’s just sprouting up through a new seed, a new gift of God’s love and incarnation. With new peace, my life continues forward – and with such gratitude for the presence and ministries of the Sisters in Oldenburg. What a gift they have to bring new life to others through the living of their Franciscan values and the sharing of that through Oldenburg Franciscan Center. Here I have truly learned: God is Good, God is Love, God Gives Life.